The first seven months of the year are already history and much has happened in our digitalswitzerland universe. Let me take these slower and hot summer days as occasion to have a look back and give you a short overview about our activities in the first half of 2018. Our valued member base is continually growing: we are delighted that as of today, we count more than 120 members to our digitalswitzerland family. In less than three years, we were able to build a strong alliance with stakeholders from the private and public sector, academia and non-profit organizations with the common aim to bring Switzerland forward. Together, we are the digital voice of Switzerland. Our team is committed to our cause and with now 16 people in our Lausanne and Zurich office, we strive to really make a difference. In our project pillar ‘Politico-Economic Environment’, our main project is the Digital Action Plan (short: DAP). Within the Digital Action Plan, we push concrete projects and recommendations in seven action fields, such as infrastructure & data policy, cybersecurity, health, society & digital transformation, regulation, ecosystem & innovation, education. It is recommended to focus and use the Blockchain technology where added value can be created quickly. In this context, one possibility would be to check whether it makes sense to base Switzerland’s new multiple eID on blockchain technology. Fact is that most of Swiss companies still need to start with the basics when it comes to cyber hygiene, software patching and risk management. Becoming cyber resilient is a first must have for any digital company. There is a lack of awareness in the economy on the interdependencies of the digital business ecosystem, and there is a lack of transparency on that matters. To know the right people at the right time can be challenging. That is why we launched our Startup Bootcamps. We see us as an enabler who can make this first connection as easy as possible – by bringing the corporate innovation managers and the startup co-founders together in one room. The success was remarkable: 80 one-to-one meetings took place during one bootcamp day. Each of the participating 20 scale-up companies was able to arrange between four and seven follow-up meetings throughout the day. The satisfaction of the young entrepreneurs and corporate representatives was accordingly high. Want to know more? Read here about our Scale Up Bootcamps and here to get insights into our Marketentry Bootcamp. In April, we celebrated the first year of our digitalswitzerland challenge and elected the bet winner of the first season: Riva Digital. The winning reason: The E-Health team has not only won its bet but is also creating a project for the general public. Inspired by what is possible when interdisciplinary teams work together on projects, which pave the way for a digital future, new companies and organizations pitched new bets. The second round of bets are in full swing and we are curious to see who will make it to the finish line in 2019. 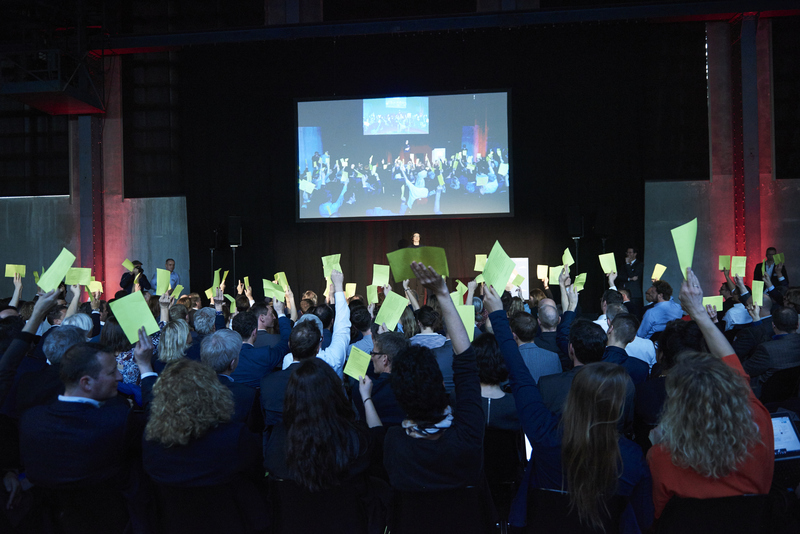 With the open challenge in June, we were looking for potential Matterhorn projects and hope to turn into reality those ideas with the potential to transform Switzerland and the world in a sustainable manner. Today, children are still learning the same content as 40 years ago – while our world is becoming more complex, required skills and the job market are changing. That is why the topic of education is so important for us and we called into life our nextgeneration initiative. Already in its second year, children had the chance to learn how to code, build robots or think computational during our nextgeneration summer camps. The second season of the nextgeneration camps were a success and several media reported from site. For schools, students and teachers: We are currently calling for a video competition! The theme this year is centred on what a digitalised playground (“playground 4.0”) looks like. The idea is to produce a 90-second film, using a smartphone, with a vision of what a playground 4.0 may look like. Click here to participate and for more information. Public Dialogue: Experiencing digital together! For the second Digital Day, we reached out to all regions and more partners to make it a truly national and inclusive event. And we are very happy to have all regions on board and even more! Besides the main hubs in the train stations of Zurich, Geneva and Lugano, the cities Chur, Yverdon, Sion, Fribourg, Basel, St.Gallen, Lausanne and even Vaduz will participate in the national Digital Day. This year’s Digital Day 2018 invites the Swiss population to take a closer look at the topic of digitalisation, to ask questions about opportunities and challenges and as our main claim states: experiencing digital together. In 7 so-called Theme Worlds, new technologies and all questions around digitalisation become more concrete. Our pre-campaign will be launched soon, stay tuned and keep your eyes, ears and mind open! We added another project pillar to our portfolio: our sixth pillar is called International Connectivity and aims to make Switzerland better known abroad as a deeptech nation. We want to connect with other international tech hubs to learn, exchange and foster the international awareness for the Swiss innovation and technology ecosystem. We are optimistic that within the coming months, we can increase the impact for Switzerland, foster innovation and collaboration, raise awareness and involve all stakeholders, from the company to every individual in Switzerland in a dialogue about the challenges and opportunities digitalisation holds for all of us. Become part of the conversation: Either through Twitter, Facebook or Linkedin. Or the old-fashioned way: You find us at the Kraftwerk Zurich. And of course: Be part of the Digital Day 2018 – we are looking forward to meeting you! Subscribe to our newsletter und if you have anything on your mind, please feel free to contact us anytime. The post Half-time 2018: Time is flying in digitalswitzerland terms appeared first on digitalswitzerland.